While Germany’s producer price index supported EUR, USD was weakened due to jobs data. 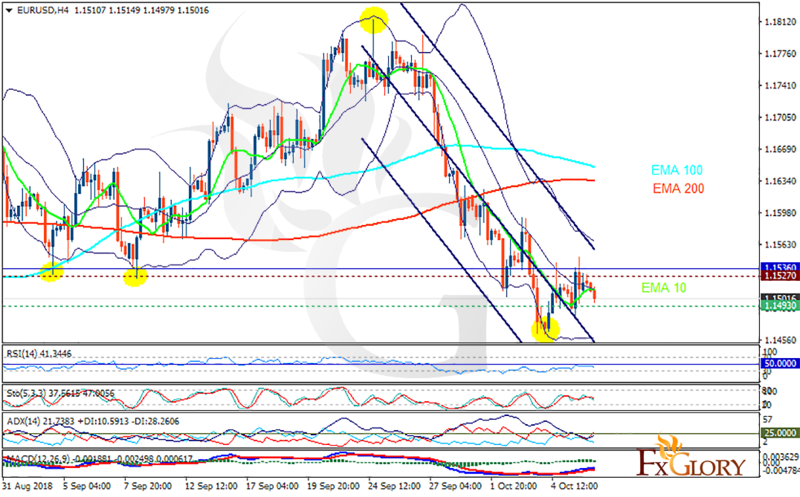 The support rests at 1.14930 with resistance at 1.15270 which both lines are below the weekly pivot point at 1.15360. The EMA of 10 is moving with bullish bias in the descendant channel and it is below the EMA of 200 and the EMA of 100. The RSI is falling towards the oversold area, the Stochastic is moving in middle ranges and the MACD line is above the signal line in the positive territory. The ADX is showing sell signal. There might be pullbacks towards the lower Bollinger band at 1.145 but EURUSD is growing up towards 1.156 eventually.